You're Hired! Interview takes a unique look at body language in interviews, teaching you how to perform brilliantly to get the job you want. Full of practical techniques to prepare you mentally and physically, this book gives job hunters the skills and confidence to make the best impression. 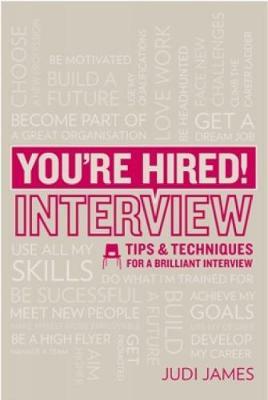 Written by TV body language expert Judi James, this book examines the psychology behind interviews, making sure you can confidently tackle all aspects of the process, be that a powerful presentation or a tricky Q&A. Get ahead of the competition with professional insights into self-presentation, social behaviour and helpful exercises to assess your skills and make sure you're hired! You're Hired! is a brand new series from Trotman that guides job hunters through the challenging process of finding and securing their perfect role. Each book is written by an expert in their field, and filled with tips, advice and useful exercises to help prepare for every stage of the job search.